One of two unused animation cels from an alternate ending. 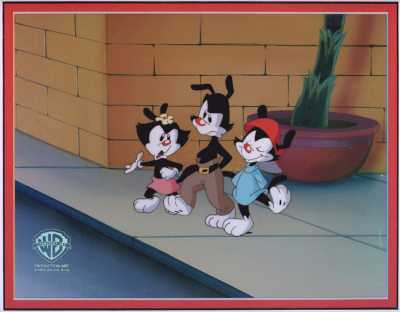 Animaniacs is an animated TV series about three siblings of the Warner family that aired on Fox from September 1993-September 1995 and then on The WB until November 1998, then continuing on that channel in reruns until 2000. One of the most famous episodes, titled "Potty Emergency", concerns Wakko having trouble finding a place to use the bathroom after the one at the movie theater is out of order. On current prints of the episode, two scenes are missing that has not resurfaced on the Internet. The first scene is a different version of the park scene where the man at the park holding the hose turns it away from the camera, with the nozzle not visible. It was first mentioned in a fan community for the show in 1994, but it hasn't resurfaced anywhere online yet. The second of these cut scenes is more well-known among the community of Animaniacs fans. As shown in the first surviving animation cel (available to view on this page) the episode originally ended with Dot complaining about the number of trash people throw into the streets as they leave the movie theater. 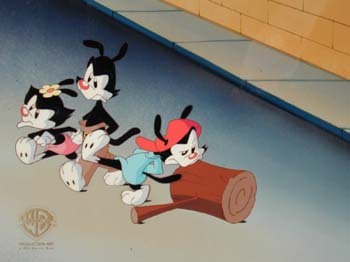 The second cel shows the siblings passing Wakko's mallet. The second of two unused animation cels from an alternate ending. "Potty Emergency" on Animaniacs Wiki.